Maitake, Grifola frondosa, is a mushroom found growing wild in Japan and in forests in the eastern part of North America, where it grows on dying or already dead hardwood trees. The word maitake means “dancing mushroom” in Japanese; the mushroom was given this name because people were supposed to have danced for joy when they found it. It is also called “hen-in-the-woods” and can reach the size of a head of lettuce. Because maitake comes from the polypores group, it produces a bunch of leaf-like clumps that are intertwined. During Japan’s feudal era, maitake was used as currency; the daimyo, or provincial nobles, would exchange maitake for its weight in silver from the shogun, the military ruler of Japan. The mushroom is also cultivated in laboratories by growing a small amount of it on a sterile medium in a Petri dish. This culture is used to make what is called a spawn, which is then inoculated into production logs made from sawdust and grain. During the next 30 days, the spawn settles in and binds to the log. Then the logs are placed in temperature- and humidity-controlled mushroom houses until the mushrooms begin forming. They are then moved to a mushroom fruiting house. The entire procedure requires a period of 10–14 weeks. Maitake’s main ingredient is the polysaccharide beta-1.6-glucan, a complex carbohydrate substance high in sugar components bound together. The patented extracted form of this glucan is called the Maitake D-Fraction. Both terms can be used interchangeably. Two other components of maitake, named fraction X and fraction ES, were discovered by Harry Preuss, a medicine and pathology professor at Georgetown University Medical Center in Washington, DC. Although the Chinese and Japanese have used maitake in cooking and healing for many centuries, it is only in the last 20 years that studies have been conducted concerning its functions. Maitake’s main functions are activating the immune system and acting as an antitumor agent. Maitake is known as an adaptogen and tonic, and as such it aids healthy people to keep their levels of blood sugar, blood pressure, cholesterol, and weight normal. The beta glucan in maitake is a cell-surface carbohydrate. This means that beta glucan aids cell communication in specific circumstances. As a polysaccharide, this glucan activates the white blood cells, called macrophages, which in turn devour microorganisms that produce disease, as well as tumors. A 1995 study at Japan’s Kobe Pharmaceutical University investigated the effects of maitake’s D-fraction on cancer in mice. Results showed 73.3-45.5% reduction in breast, lung, liver and prostrate cancer growth, 25% reduction in leukemia, 33.3% reduction in stomach cancer and 0–16% in bone cancer. These benefits increased 4–13% when combined with traditional chemotherapy treatment, as well as reducing chemotherapy’s side effects and making it work better in treating cancer. Researchers attribute this latter result to the X and ES fractions of the mushroom. More recent studies of the use of MD-fraction in treating cancer patients have also found that its effectiveness varies somewhat depending on the type of cancer; a higher proportion of patients with cancers of the breast, lung, or liver showed improvement than patients with leukemia or brain cancers. Another study by the same group of researchers looked at maitake’s D-fraction function of activating memory T-cells. In turn, these T-cells remember the cells that started the tumor growth and nail them for destruction. The study found that maitake both decreases cancer cells and prevents them from occurring elsewhere in the body. In addition to its antitumor effects, maitake extract appears to increase cellular immunity to cancer. Cancer research on apoptosis is one of the main areas of study. This process of programmed cell death is found to kill not only cancer cells, but all cells. At the Department of Urology, New York Medical College, in vitro research by Hiroshi Tazaki and his team shows that the D-fraction can kill prostate cancer cells. Preuss, who discovered the fraction X (anti-diabetic) and fraction ES (anti-hypertensive)components of maitake, conducted studies based on the hypothesis that such chronic diseases of aging as diabetes, hypertension and obesity are connected partly to glucose/insulin disorders. From his 1998 study, Preuss concluded that maitake could positively affect the glucose/insulin balance and prevent these age-related diseases. A study done at Georgetown University in 2002 found that an extract of maitake does indeed improve glucose/insulin metabolism in insulin-resistant mice. Maitake’s affect on liver and cholesterol were discovered in two more studies at Kobe Pharmaceutical University. A 1996 study on rats with hyperlipidemia were fed either cholesterol or dried powder containing 20% maitake mushroom. Results showed that maitake altered the metabolism of fatty acids by stopping fatty acid from increasing in the liver and fatty acid levels from rising in the blood serum. Maitake can also decrease high blood pressure. In 1994, a study at New York’s Ayurvedic Medical Center, hypertensive patients took maitake concentrate two times daily for a month. Results showed their blood pressure decreased from 5–20%. Studies have also shown maitake can help AIDS patients. In Mushrooms as Medicine, two 1992 in vitro studies, one in Japan and one at the United States National Cancer Institute, showed that maitake both improves T-cell activity and kills HIV. One study, using a sulfated maitake extract, stopped HIV killing T-cells by 97%. Another study, in 1996 at Memorial Sloan-Kettering Cancer Center in New York, looked at the functions of a variety of edible mushrooms, including maitake. Although the study showed that the information for mushrooms wasn’t as strong as for vegetables, such as broccoli and cauliflower, the study also recommended that more research should be done regarding the use of mushrooms to treat serious diseases, such as cancer and AIDS. In 1999, the U. S. Food and Drug Administration (FDA) granted Maitake Products approval to conduct a clinical study using maitake (in its patented D-fraction form) in people with advanced breast cancer and prostate cancer. The American Cancer Society (ACS) is less supportive of the claims made for maitake, stating in its guide to complementary and alternative treatments that “There is no scientific evidence that the maitake mushroom is effective in treating or preventing cancer in humans.” The ACS points out that the Japanese studies of maitake have been done on mice, and that further research is necessary to show that the benefits also apply to humans. Maitake mushroom may be eaten fresh, made into a tea, taken as capsules, or taken as an alcohol extract. When maitake mushroom is cooked, the taste is woodsy. The mushroom must be washed and soaked in water until it turns soft. It is sautéed in oil and used as a side dish, in stews, sauces, or in soups. Maitake mushrooms will keep from five to 10 days if properly stored in a paper bag in the refrigerator. Dried maitake pieces may be made into a tea by using two to four grams per day, split into two preparations of tea. It is best to drink the tea between the morning and evening. 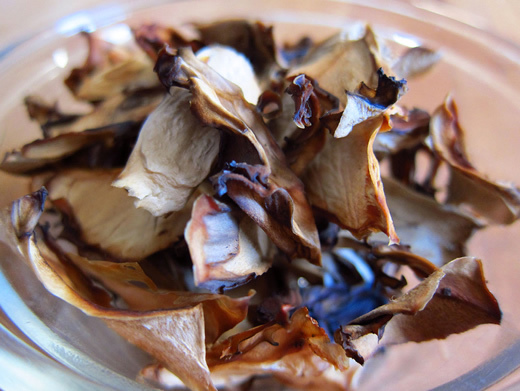 To make the tea, it is first required to grind the dried maitake in a coffee grinder, then it is added to water, boiled and simmered from 20 minutes to four hours. Tea should be filtered before drinking. Grounds can be reused as long as they retain their color. 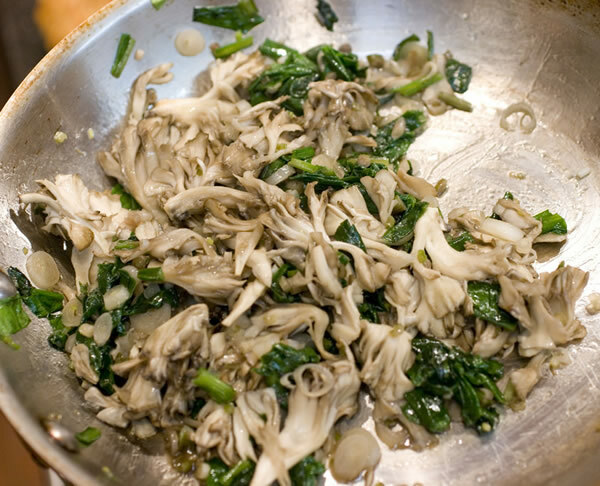 Maitake can also be mixed with other tonic herbs, such as green tea or ginseng. Capsules are available in 150-500 mg with a standardized D-fraction powder extract of 10 mg. They may be taken twice a day between meals or first thing in the morning. Dosage varies from one capsule of 150 mg to six capsules of 500 mg. It is best to consult with a health care provider for therapeutic doses. Taking maitake with vitamin C helps to increase maitake’s absorption. Capsules should be stored in a cool dry place. The FDA approved-for-clinical-study maitake products are available in D-fraction extracts of two to four ounce bottles, as well as capsules. Maitake is not recommended for children. Pregnant women and nursing women should consult a health care provider before taking maitake. 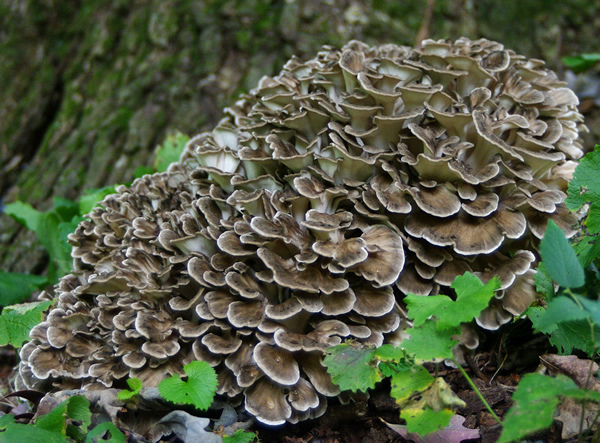 People with such autoimmune diseases as lupus should avoid maitake. The mushroom stimulates the immune system, and their immune systems are already in overdrive. Side effects are rare and the only known one is possible loose bowels and stomach upset if the whole mushroom is eaten. To avoid this, take in capsule form. As of 2002, no interactions between maitake and prescription medications have been reported.